Earth never stops surprising us. Every planet offers some sort of natural peculiarity that needs an explanation that makes us eager to study more on earth science. Some of these sites are difficult to enter while others are busy tourist destinations. Following are some of the world’s most terrifying unexplained phenomena and weird places. Mount Roraima Brazil. It is a mountain covered by dreamy clouds. The top of Mount Roraima is flat resembling a plateau. It is one of the oldest formations on earth. It is weird because of its shape but also mysterious because of its clouds .the plateau was formed by water and winds and the species over here can’t be found anywhere else. 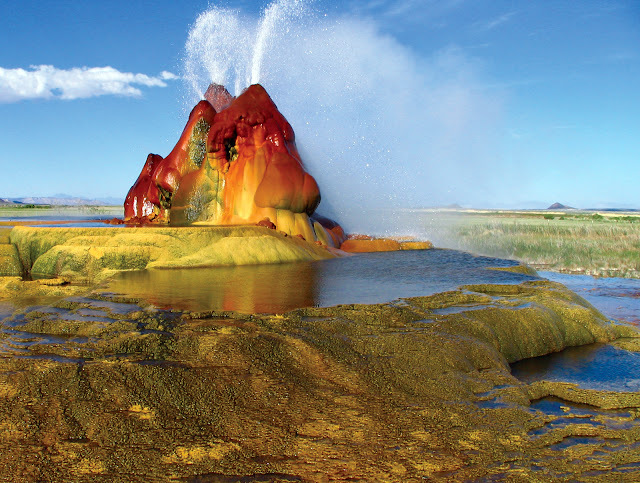 Fly Geyser United States: in 1916 a well was drilled into the ground, however in 1960 hot water began shooting out of the well. The salts which were dissolved gradually built up into huge colourful mounds that keep gushing out water that almost reached five feet high. This however is not a tourist spot because no one can go close to it. The Bermuda Triangle Atlantic Ocean: this is a mysterious place. This triangular area lying between Bermuda, Miami and San Juan is highly famous for disappearance of people, water vessels and aircrafts that try to cross this point. No one till now knows whether it is the weather playing tricks or some aliens and monsters abducting people. There is something really weird. Blood Fall Antarctica: it refers to a blood red waterfall that flows staining the snow white face of Taylor glacier. The researchers have found large quantities of iron oxide in west Lake Bonney .it is because of this path breaking discovery which has created the reason for the color of the falls. It is more astonishing in spite of the iron, the microorganism are able to survive at a depth of 1300 feet under the ice. Travertine pools of Pamukkale Turkey: it is one of the top most tourist attractions. Every year quiet a number of tourists visit this paradise. It is referred as the 8thwonder of the world. This area looks snow-covered but it is actually a group of small pools that results from calcium carbonate deposits. These deposits are the bi-products of seventeen natural hot springs. Magnetic hill Moncton, New Brunswick and Ladakh India: there is a scary phenomenon tha t sometimes one might find the car going uphill without driving. Is this place haunted or there is a magnetic force underneath the surface of the earth. The reason behind this is still a mystery. Cano Cristales Colombia: this river is named as the most beautiful river in the world. during the month between September and November the river displays myriad shades of colours such as yellow, pink, red, green and blue. This is caused by the millions of plants growing under the water. Salar de uyuni Bolivia is a flat surface made of salts, double up as a clear reflective mirror when it is covered with water. When you walk on this you will feel as if you are walking on the clouds. Unlike any other place on earth the salar de uyuni is breath-taking and provides a beautiful experience that will not be quickly forgotten. Sailing stone of death valley California: a sailing rock is referred as the rock that can slide or move in a particular track without the help of animals or human beings. What is surprising that no one has got any explanation to this? It becomes even strange when some rocks slide in a straight line while others move across curved or circular tracks.